One of my favorite Gospel teachings is that of the Plan of Salvation. I've loved it since I was young. What hope and purpose it gives us in this life. The majority of the world wonders, why am I here, where did I come from, and where will I go when I die? We are so blessed as members of the Church of Jesus Christ of Latter-day Saints to have these answers to these questions. 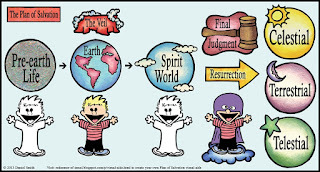 We lived with our Heavenly Father and our Elder Brother, the Savior Jesus Christ, before we came here to this earth. There was a great council held where all that have ever lived, are living, or yet will live on this earth participated. Two plans were offered to us. The first was by Satan. He said send me down to earth, and I will make everyone choose the right so that not one soul will be lost. In return, Heavenly Father, I want all the glory for myself. The second plan was from our Elder Brother, Jesus Christ, He said I will go down and show them how to return to live with thee, Heavenly Father, and the glory will be thine. Satan, because of his greed to try and make himself greater than our Heavenly Father, was cast out of the Father's presence along with 1/3 of the hosts that were in that great council. They were sent here to earth to never obtain a body. They will never progress. We all chose the Savior’s plan, but how do we know this? Because we are here with a physical body to do our best and do all that is required while we are here to qualify us to return to live with our Heavenly Father. What are those things that we are required to do in this life? First, baptism by immersion by one who holds the Priesthood Authority; second, the laying on of hands for the gift of the Holy Ghost; third, we must go to the Temple and receive our Endowments; fourth, we must be sealed in the Temple to our spouse for time and for all eternity; fourth, we must repent daily for the sins we commit; fifth, we must endure with faith to the end. If we do these things, we will have favor in the Lord’s sight, and, through his love and grace, we will be able to live with Him and the Father in the Celestial Kingdom. Those who choose not to follow this path, do as they please, and live a not so pleasant life, will inherit the lowest kingdom, the Telestial Kingdom. Those who have lived a good life but never found the saving truths, or chose not to accept those savings truths, will inherit the Terrestrial Kingdom. But before we are judged and assigned the degrees of glory or kingdoms in which we earned, there is a place that we go to when we die. That place is known as the Spirit World. The Spirit World is divided in to two places: Spirit Prison and Spirit Paradise. Those who have accepted the Gospel in this life and died are in Paradise and have the great responsibility of doing missionary work and preaching to those in Spirit Prison. We have a great responsibility here in this life to get saving ordinances done for those who are in Spirit Prison. These ordinances are a physical ordinance and must be done in the flesh. That is why we do Genealogy work. To find our loved ones and get their temple work done for them. 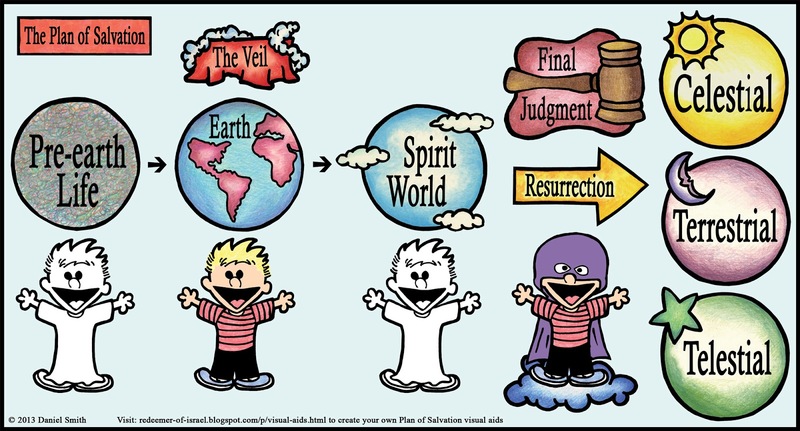 That way, if they accept and believe what is being taught to them in the Spirit World, they will have those ordinances done for them and qualify themselves to live with our Father in Heaven in the Celestial Kingdom. Oh what joy and peace this gives me. I know that these things are true. I know that I will see my loved ones again and that families can be together forever. I know that if I will endure well to the end, I will live with my wife and kids and my Heavenly Father. How grateful I am for a loving Heavenly Father who provided this Plan of Salvation or Plan of Happiness. He truly loves each and every one of us and knows us by name.